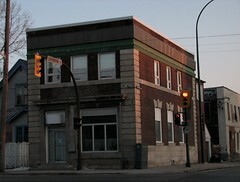 It's a handsome little building at the corner of Sherbrook and Logan that I've passed hundreds of times. I thought I would look into its past and found quite a story ! The neighborhood around Nena (then Sherbrooke, now Sherbrook) and Logan is similar to what you see today. Some warehouses and manufacturing to the north toward the railway tracks, mostly residential to the south. At the intersection itself, in 1903 a commercial development appeared with Colcleugh & Co Drugstore (by the 1920s known as Roberts Drugs) and a corner store called Dominic's (owner Dominic Caliguri). 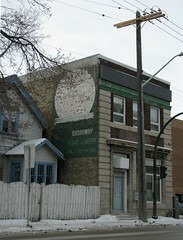 In May 1910 the Union Bank of Canada called for tenders for a $10,000 brick and stone building at the south east corner. In the 1920s the Union merged with the Royal Bank of Canada. Shortly after the building was rechristened, it was the scene of a daring and deadly daylight robbery. Wilfred Bonnin, aka William Davis, was a career criminal born in Montreal staying at the McLaren Hotel. 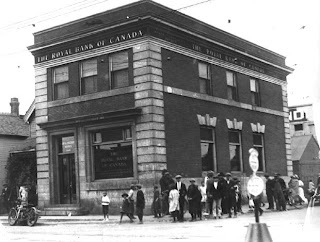 On the morning of Friday, May 28, 1926 he hailed the taxi cab of Fred Shatford and made his way to the Logan and Sherbrook branch of the Royal Bank. Once inside he went to the teller window and pulled a .32 calibre Smith and Wesson. Accounts of the robbery vary by witness and newspaper but the common points is that in the time it took for the teller to hand over $1,500 or so from his wicket, Bonnin turned toward the collections cage and shot 19 year old William Garvie. It happened so fast that Garvie did not have a chance to react and the bullet killed him instantly. Garvie, 19, was from Holland, Manitoba and had just graduated high school there before taking a job with the Royal Bank in the fall of 1925. The youngest of 6 children, he is buried at Holland's Brookdale Cemetery. Bonnin fled into the waiting taxi and ordered Shatford to "Step on her, kid, if you don't want to die." Shatford, a 26 year old returned veteran, flatly refused. Bonnin jumped out the fired a stray shot at the vehicle. Next, Bonnin tried to commandeer the truck of John Campbell. Campbell testified that Bonnin pointed the gun at his head at close range and pulled the trigger twice but the gun did not fire. Bonnin fled on foot. Over the noon hour the ensuing manhunt caught up with Bonnin holed-up in a house at 681 Logan, (now demolished.) A gunfight took place and a couple of people, including the Chief Detective, was injured. It took six police bullets to bring Bonnin down. The following day city council passed a motion praising the arresting officers and cabbie Shatford and that "The sympathy of all citizens goes forth to the parents of Maurice Garvie, who without any opportunity for defense, was shot dead." (WFP June 1, 1926). Bonnin was rushed to St. Boniface Hospital and recovered well enough to stand trial. He was just 24 years old but in and out of trouble with the law from the time he was 13. His last stint was in a U.S. prison where he became addicted to heroin. After is release he travelled around Canada for a while before settling in Winnipeg. Heroin was in short supply in the city so he switched to morphine. He claimed that it was this new addiction that caused him to go for days in a blur and said that he couldn't even remember the events of the day in question. At the time of his arrest he told officers "The bank clerk was killed because he didn't put up his hands. It was a case of a life for a life and while I am sorry I killed him, he should have known I meant business and did what I told him." On November 11, 1926 Bonnin was sentenced to hang at the Vaughan Street Jail. Arthur Ellis, Dominion Hangman, performed the task at 7:35 a.m. on January 25, 1927. Bonnin is interred in St. Mary's cemetery. 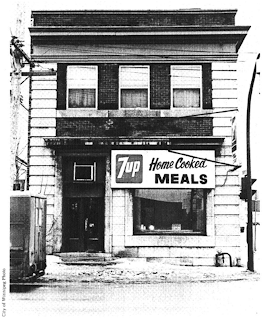 In 1939 the bank closed and 646 Logan spent the next three decades as a restaurant / bakery. 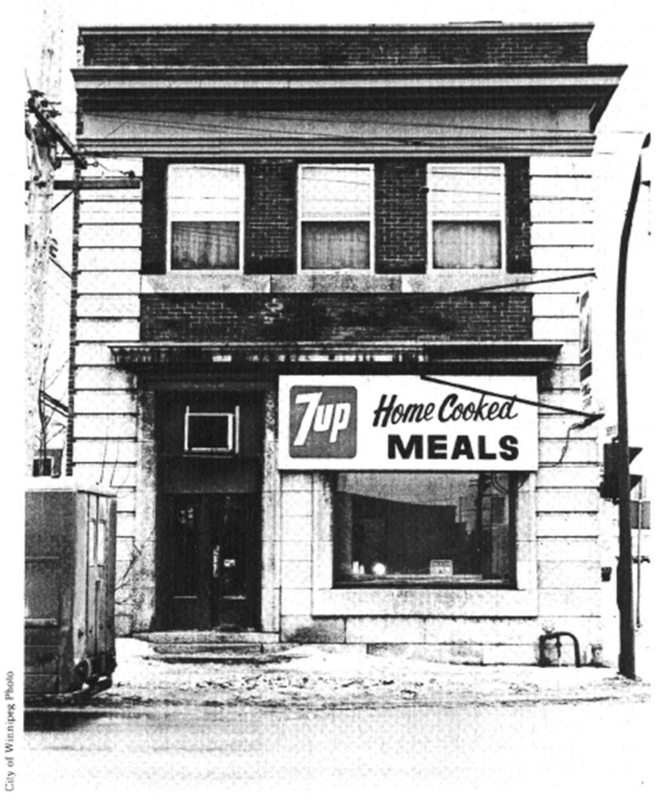 The first post-bank owner was Mr. W. Zanke who converted the old bank vault into a bakery oven. Between 1946 - 51 it was Western Bakery and Lunch Bar. From 1952 to 1960 Johnny's Lunch Bar. In 1961 it became Joyce's Grill. Joyce's was owned by the Toholke family who also lived upstairs. Leonard had worked for City Dray for 22 years, wife Helen raised the children; Joyce (b. 1949), for whom the place was named, and son Terry, (b. 1952). Terry was killed in a motorcycle accident in 1968 just blocks from home. He was 16. Joyce grew up working in the diner and graduated from Tec Voc in 1967. She married, moved to East Kildonan and began a 32-year career at the Health Sciences Centre. After Joyce's Grill, a Mr. Wong took it over. The upstairs was leased out as living quarters and the downstairs remained a restaurant. In 1993 when there was the short-lived Sher-Log Restaurant. For a number of years Kali Shiva AIDS services has owned the building. They operate Sunshine House, a drop-in resource centre for people living with HIV and those at risk of contracting it. It also runs programming for HIV positive women. I think William Davis bears striking resemblance to a young Charlie Sheen (a la drug addict in Ferris Bueller's Day Off) which just sort of amuses me. I remember when that building was for sale, I suppose right before Kali Shiva bought it. I think it was only about $99,000 (but of course I could be remembering wrong) and I thought about what a great (huge) house it could make! I decided against it because I figured it would require more renovating than my budget would allow. Thanks for the tidbits on a building I pass all the time! Wow, you're right, he is quite Sheen-esque ! Now whenever you drive past it with someone you can share the true crime story ! In the mid-80's it was a grocery store. Impressive research as always! Good job! Thanks for filling in the gap, marty. And thanks Vf7 ! What a great little history! I always enjoy reading your blog. Very interesting history on how the Kali Shiva AIDS services building came to be. I've wondered about this nice little building, too. This is a great summing up. A streetcar sign in the picture, and one in the newspaper ad :) very cool and great info. I noticed the streetcar as well ! I guess if you're going to drop a bank somewhere that's exactly where you'd want to do it - at a streetcar stop !